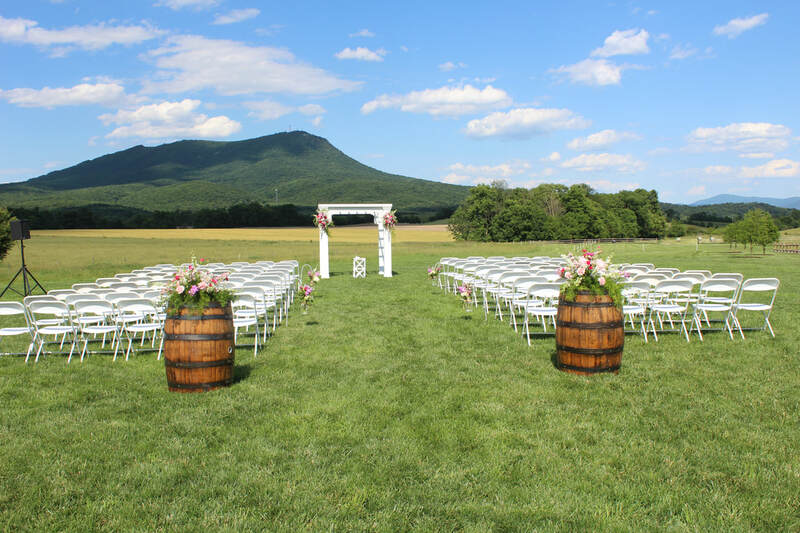 The barn and surrounding grounds abide by Virginia Assembly Hall Regulations. 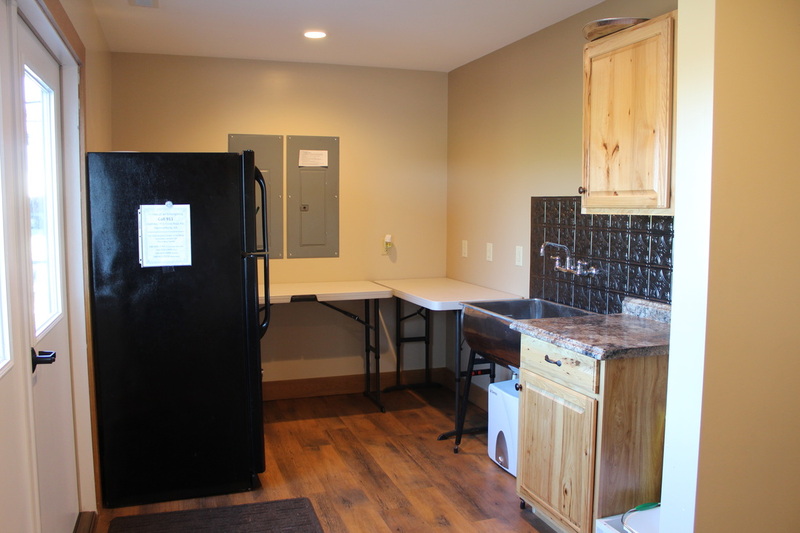 All facilities are also ADA compatible (handicap accessible). 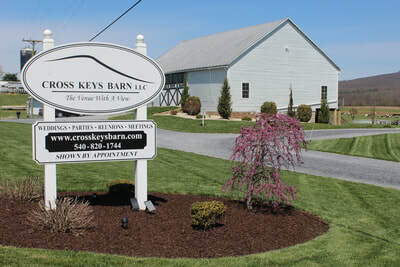 Cross Keys Barn LLC only has one event going on at a time. 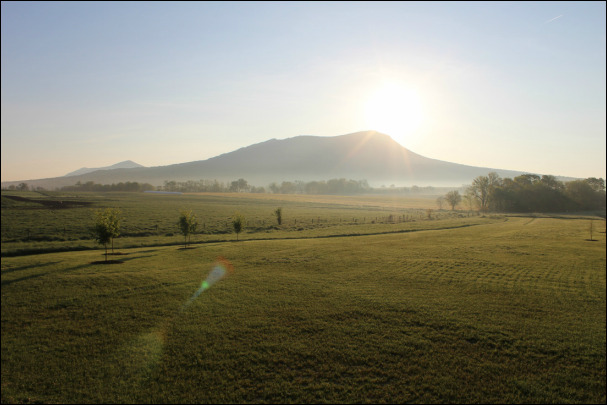 You will have exclusive use of the facility. 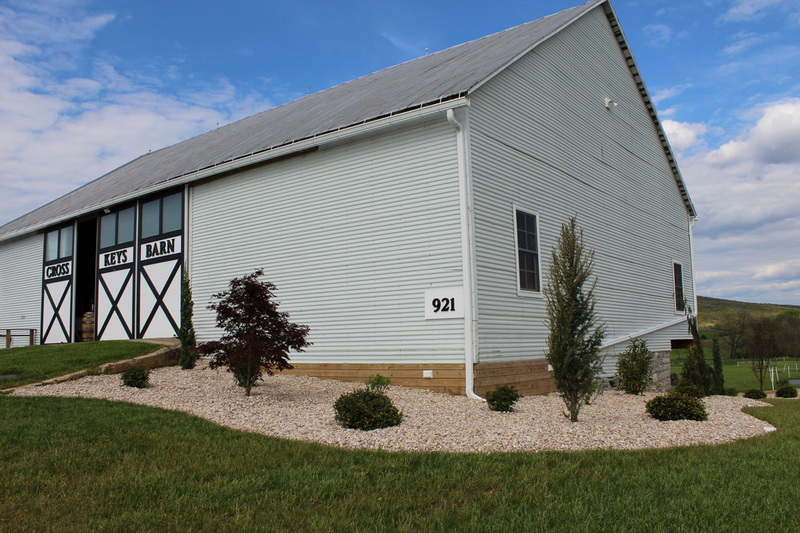 The original bank barn is 100 years old and consists of 3300 square feet. 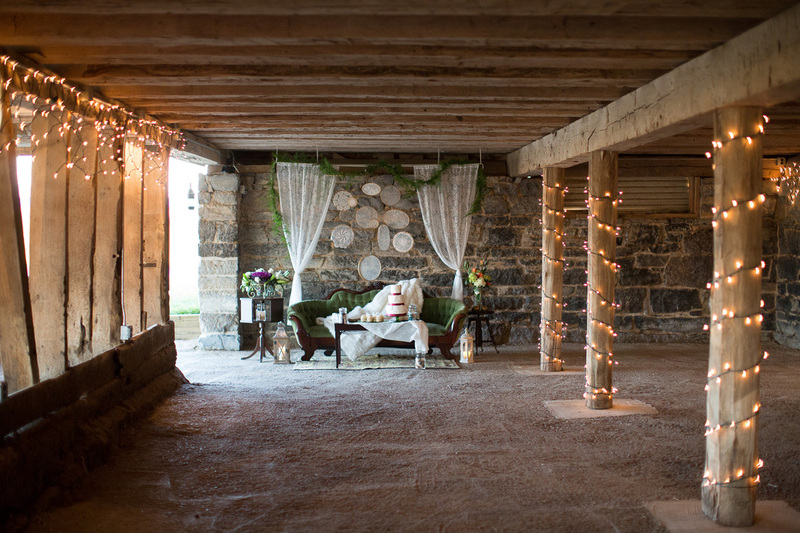 The interior of the bank barn still has its original barn wood and siding which provides a rustic feel to the space. 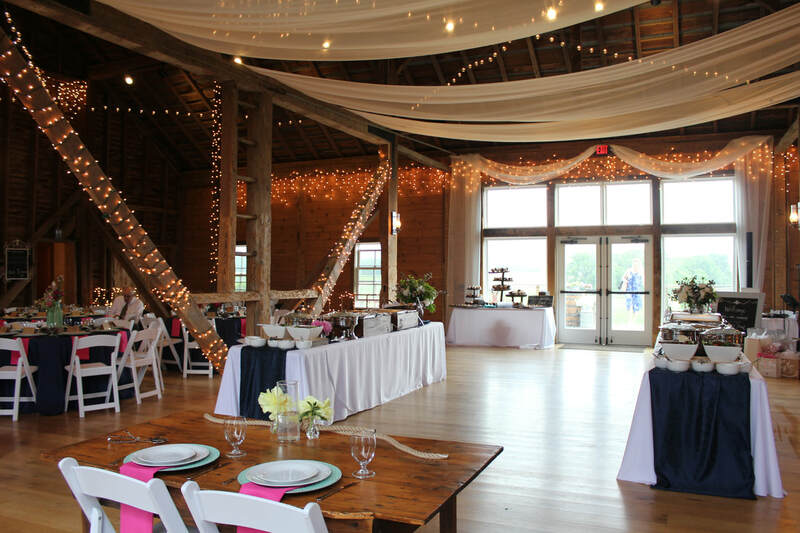 With its 28 foot cathedral ceiling, exposed beams and beautifully finished oak floor, Cross Keys Barn LLC is the perfect location for a wedding reception, corporate event, or private party. 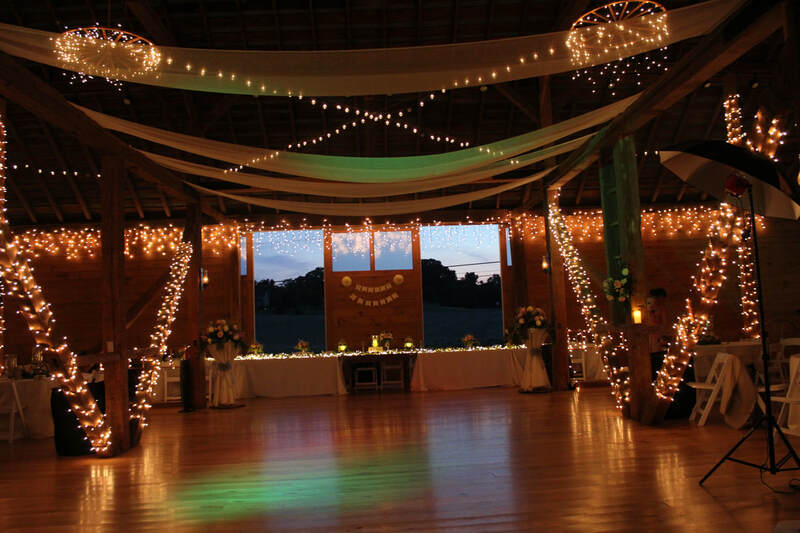 The barn is already beautifully decorated with icicle and miniature lights for aesthetic lighting but waiting for you to add your own special touches. Windows were added throughout the original barn for plenty of natural light and so our guests could enjoy the wonderful views that surround the barn. 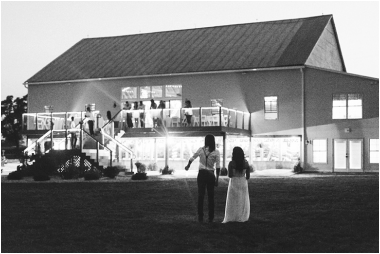 A large portion of the East side of the barn is covered in vast glass windows and double doors that create an outdoor ambience. 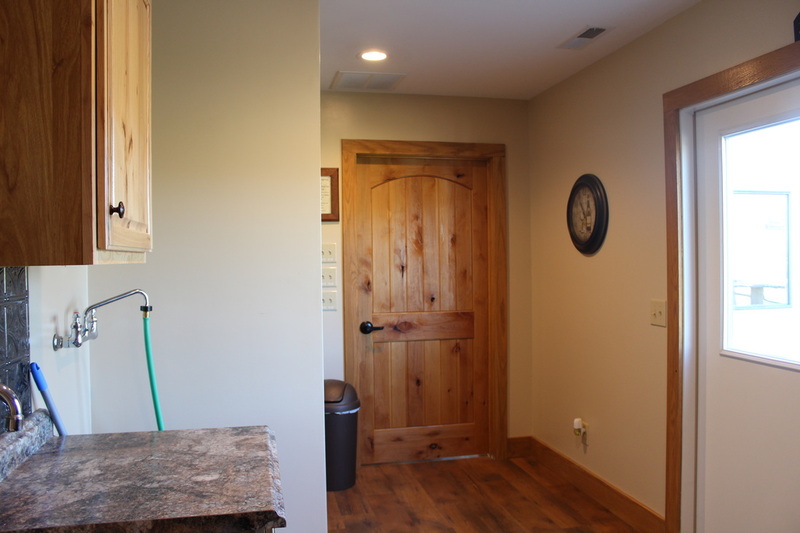 Doors open up to a newly constructed 45ft x 16ft deck. This 716 square foot deck allows guests to take a front row seat to the scenic Shenandoah Valley. 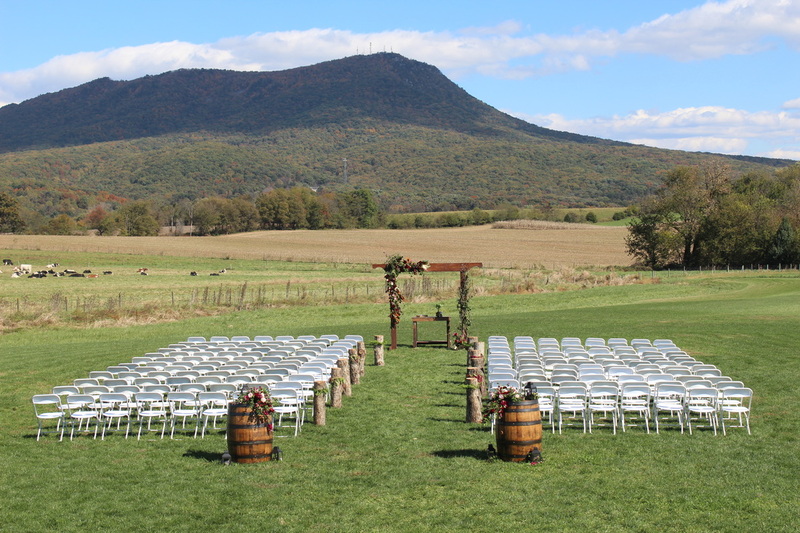 The Massanutten Peak and Blue Ridge Mountains provide a stunning backdrop view from the Eastern side of the barn. 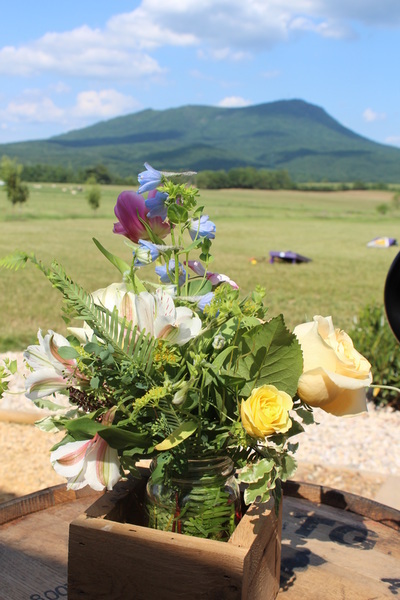 Come relax in the barn or on the deck and enjoy the breath taking views of the mountains and farmland. During renovation, a new addition was added in the summer of 2014. 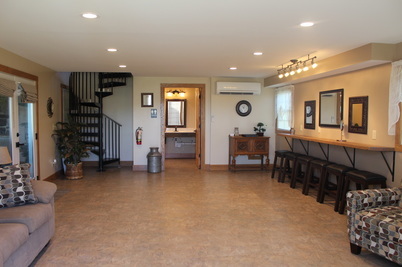 The upstairs addition is 648 square feet and consists of a prep room, men and women’s bathroom facilities, and a dressing room area. 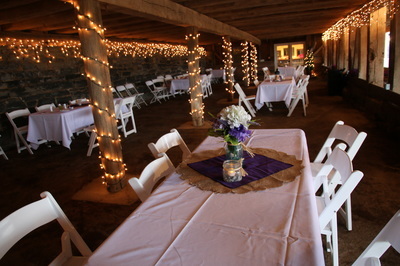 A groomsmen dressing area is located in the upstairs addition. 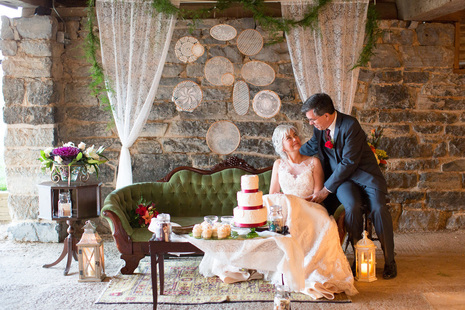 This room includes a grand window that allows groomsmen to overlook the ceremony site while guests arrive. 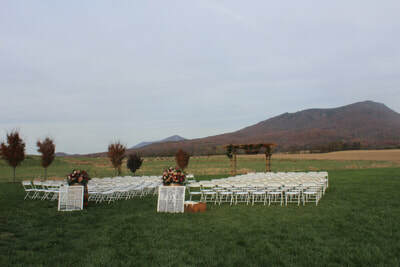 Comfortable chairs are located in the air conditioned room so the men can have some space to relax before the ceremony. The Bridal Suite is located in the downstairs addition. 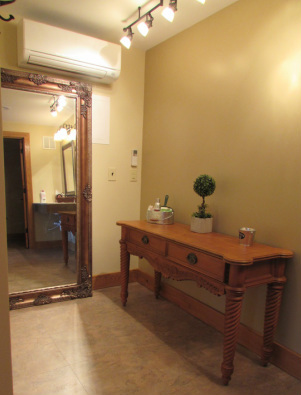 This air conditioned suite includes large mirrors, counter tops, and multiple plug-ins in order to provide a convenient area for getting ready. The suite also has an adjoining bathroom and an area with couches and comfortable seating for the bridal party to enjoy. 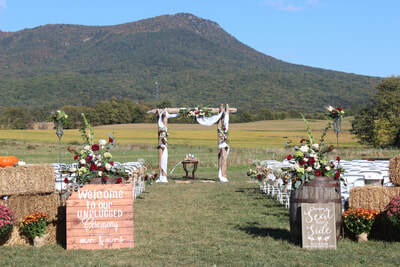 An optional ceremony site is located directly behind the barn. The ceremony site is situated among the lush green pasture with the beautiful Massanutten Peak as a scenic backdrop. 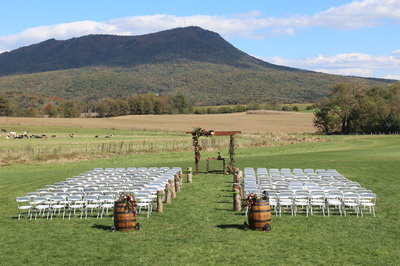 This view is sure to provide stunning picturesque wedding memories. 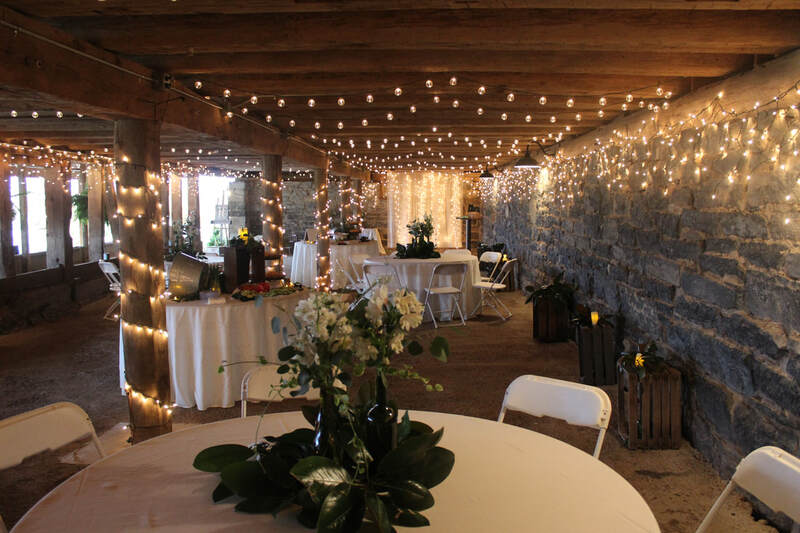 The Stone Room, located on the lower level, consists of an authentic grey limestone wall, native to the Shenandoah Valley and showcased with accent lighting. 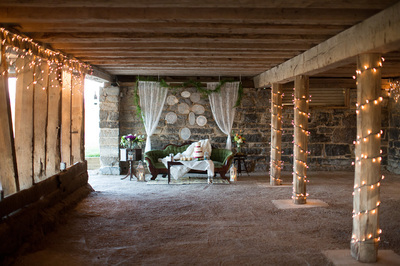 Since this area underneath the barn is naturally cool in the summer, it is perfect for picnics, birthday parties, or wedding cocktail hour. If you have scheduled an outdoor wedding at our venue and the weather decides not to cooperate, this area is perfect for a backup plan. 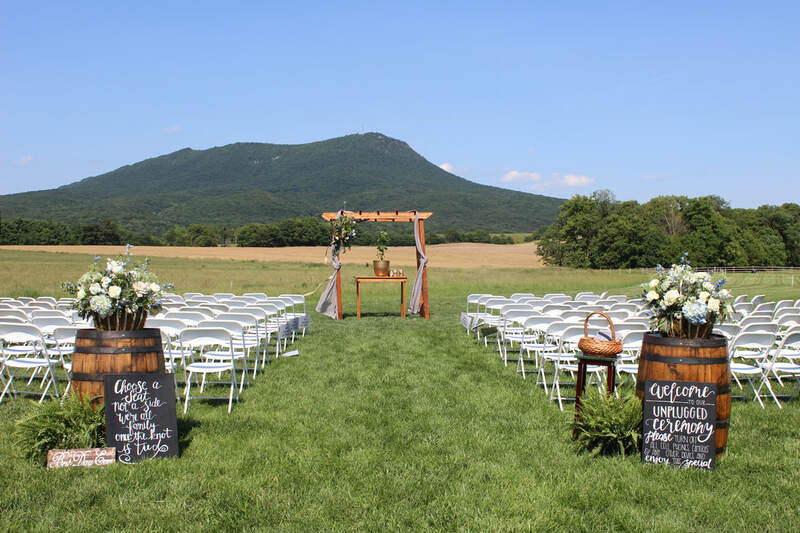 No need to rent a tent. 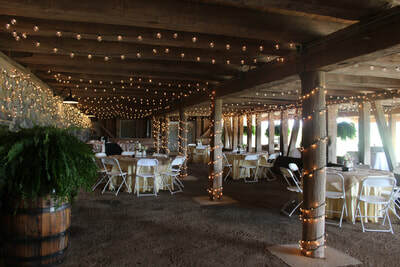 The downstairs area flows out into a luscious green grassy area. 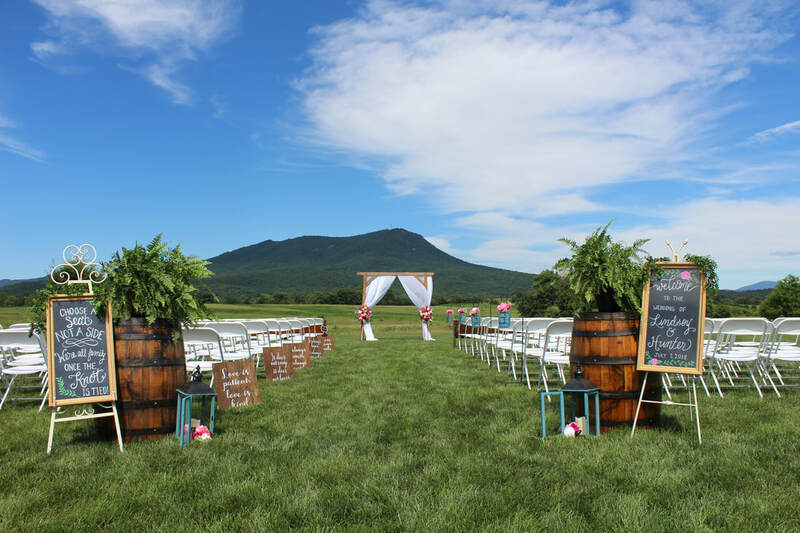 This area is perfect for yard games for your guests to enjoy such as corn hole or volleyball. This outdoor area also includes fire pits for a cozy atmosphere or for making scrumptious s’mores. Our venue is the only renovated bank barn in Rockingham County with modern bathroom facilities. 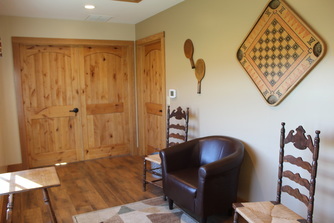 Men and women’s bathrooms are located in the upstairs addition. 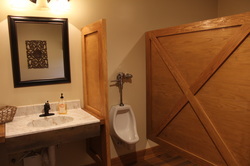 An additional unisex bathroom is located in the downstairs addition. All bathrooms are air conditioned and handicap accessible. 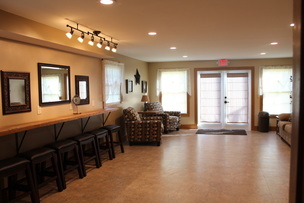 The prep room is located in the upstairs addition. This room includes removable tables, a sink, a refrigerator and multiple plug-ins for warmers in order to provide a convenient place for your caterer to prepare for your event.